Half Finger Cycling Gloves for Kids Children Breathable Anti-slip Camouflage Outdoor Sports Gloves Boy's Mitten by MARZE at Melon City Bike Club. MPN: 7u8379434. Hurry! Limited time offer. Offer valid only while supplies last. Size: about 4.72x3.15 inches(12x8cm) It usually fits kids aged from 4 to 12 years old or those whose circumference is between 5.5 to 6.7 inches. It usually fits kids aged from 4 to 12 years old or those whose circumference is between 5.5 to 6.7 inches. 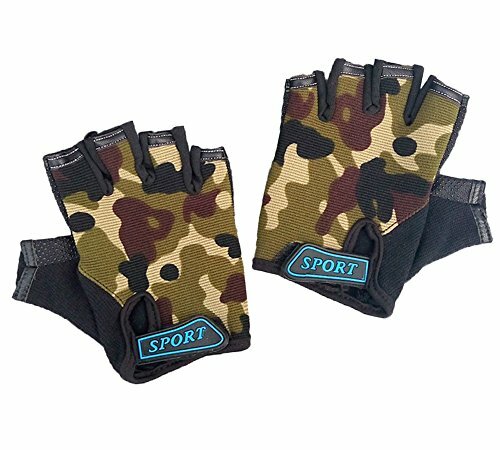 Camouflage gloves is so cool and attractive to children.Great gift to them! Breathable and elastic fabric coming with half finger design,it lets kids wear comfortably and play freely. Hook-and-loop straps is very important cause it ensures kids to adjust easily. Non-slip feature enables children to ride bike safely and hold things stably. Using scope:cycling,hiking,running,skating,riding and other outdoor or indoor activities. Never forget to give your kid a cool and good gloves when they're cycling or playing.It does protect them a lot.And this gloves meet all your requirement! Size:4.72x3.15 inches(12x8cm)----Fits circumference between 5.5 to 6.7 inches. This half finger kids gloves is suitable for cycling,hiking,fishing,riding and other outdoor sports.It helps protect kids from injury. With breathable and elastic fabric,it's easy for children to wear but not restrain them from playing. If you have any questions about this product by MARZE, contact us by completing and submitting the form below. If you are looking for a specif part number, please include it with your message.